Getting past a breakup is often one of the most difficult things to go through in a lifetime. It is even more difficult when you didn’t see it coming, and are now meant to move on with your life. The first couple weeks can be the hardest as you transition from being in a relationship, to being without that person. Here are some tips for getting through the first week or so after a breakup. And if you want to get your ex back into your life, believe it or not, but the first thing to do is to get over your break up first. One of the hardest things post-breakup is having little reminders of them. Start by purging them from your life, even if only temporary. Delete their messages and number from your phone, hide or block their updates on Facebook, remove them from other social media networks you have if you need to. Additionally, if you have stuff in your home that reminds you of them, either get rid of it or hide it away where you won’t be tempted to look at it every day. With a particularly difficult breakup, getting support from friends and family is essential. You want people by your side that will understand the situation and help you feel better. Whether it is to listen to you vent or cry, make sure you are moving on with your life, or help you get back into dating, you will need this support. Avoid friends who are still friends with your ex for the time being, because this can do quite the opposite. During the first few days, you might want to spend time alone, but after that, get out there and start having fun. Distract yourself in any way you can, whether it is hitting the gym to release those good-feeling endorphins, having coffee with a friend, or taking a few days off work to go on a mini vacation. Whatever you enjoy doing, whether alone or with friends, embrace it for the distraction. Getting over your ex will feel amazing! Moving on isn’t easy, but if you can handle a date within the first couple weeks, you might notice that you are able to at least distract your mind and heart during the breakup. You don’t want to start a new relationship, but have some fun and get back out there. 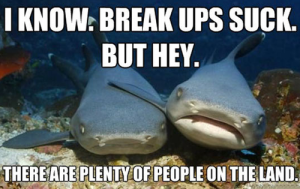 Just because you are broken up, doesn’t mean you won’t get back together. The last thing you should do is decide if you want him or her back. If so, consider going on a no-contact month, which is 30 days of not having any contact with them. You might be surprised with the results and even have them running back to you. But be sure that is what you want. One of my good friends is a certified expert when it comes to getting ex’s back. He’s so good and knowledgeable that he’s even written a book about the topic. Crazy, hey? If you want to check out his video (and I highly recommend you do so because it’s free), then click the link right below!